Some media reports suggest we're in a recession. Murray Gunn, head of global research at Elliott Wave International, said the economy is about to turn into "the worst recession we have seen in 10 years.” It may even be "worse than the Great Depression,” according to Wall Street Journal economist Peter Schiff. The New York Post shared the following statistics as context for these experts' gloomy analysis. White House Economic Adviser Larry Kudlow, meanwhile, is urging Americans to ignore the ominous warnings. 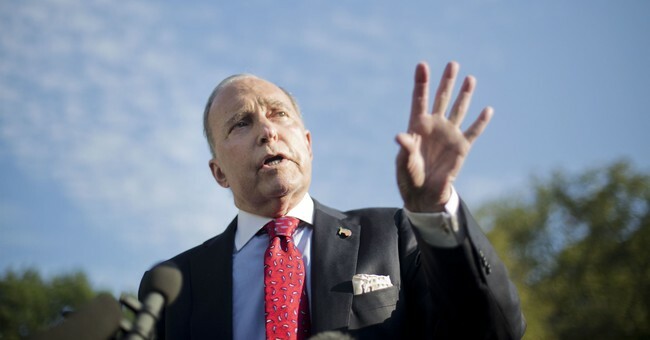 "I am reading some of the weirdest stuff about how recession is around the corner – nonsense," Kudlow told reporters Tuesday. "My personal view, our administration's view, the recession is so far in the distance I can't see it." He is especially confident in the business world. "This is going to be the best business investment cycle we will have in 20 years," Kudlow continued. "We haven't had one. I am going to be totally nonpartisan here – Dems, Republicans, really since the late '90s – I think now it is resuming. That's a key part of our planning and our own incentives." The public appears to agree with him. A new poll reveals that Americans trust Trump on the economy. His approval rating on the issue hit a new high and it's not just Gallup telling us that. In the new @CBSNews poll: 74% rate the economy “good” & 52% approve of @realDonaldTrump’s handling of the economy; yet his overall job approval sits at 39%.